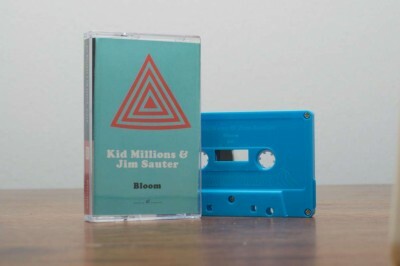 Kid Millions & Jim Sauter made one of our absolute favorite AS releases last year with “Bloom” and we are quite pleased to bring it back into print. Another 100 copies available now, this time on a baby blue tape shell! ALSO if you happen to be in Brooklyn on June 10th Kid Millions & Jim Sauter will be playing the Monofonus Showcase at Union Pool as part of the Northside Festival!! They’ll play alongside Monofonus friends Spray Paint, Running, Beach Creeps & Matchess! Come to a stellar show and grab a copy of this beauty! 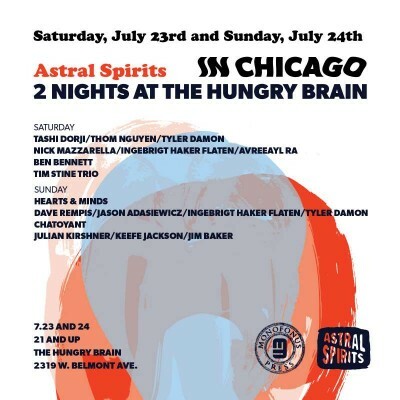 Welp this is a big one for us, we’ve been working real hard to put together our first residency of Astral Spirits artists that will happen this summer, July 23rd & 24th at the Hungry Brain in Chicago!!! Two nights of amazing music at one of our favorite re-opened venues in the country! New AS tapes will be available from Tashi Dorji & Tyler Damon (who will be joined by Thom Nguyen of MANAS for this special trio set! 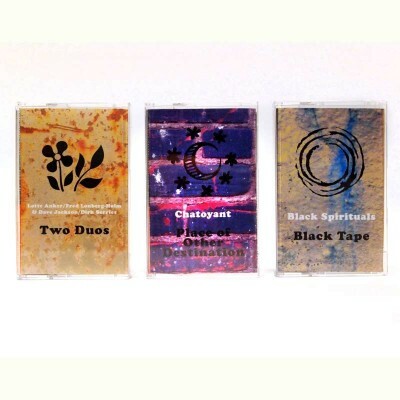 ), Ben Bennett, Tim Stine Trio, Chatoyant, Jackson/Baker/Kirshner and maybe even copies of the upcoming LP release of Hearts & Minds (Jason Stein, Paul Giallorenzo & Chad Taylor)! Also the 3rd ever meeting of Nick Mazzarella, Ingebrigt Haker Flaten & Avreeayl Ra!! AND a first time meeting featuring Dave Rempis, Jason Adasiewicz, Ingebrigt Haker Flaten & Tyler Damon!!! Please help us spread the word! $10 advance tickets for each night!! Yes, only $20 to see all these amazing folks in one place over two nights. Hearts & Minds — s/t LP out in October!